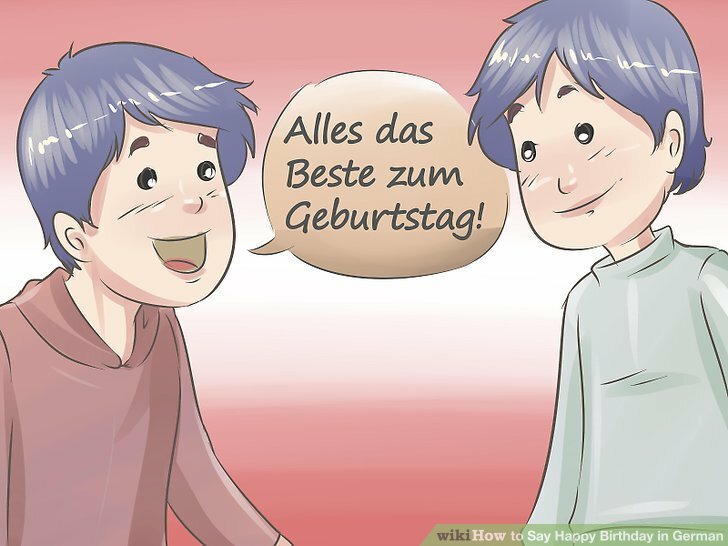 The most common ways of wishing “happy birthday” in German are “Alles Gute zum Geburtstag” and “ Herzlichen Glückwunsch zum Geburtstag.” However, there are also other ways to offer birthday wishes in German. Here are several examples you may find useful. 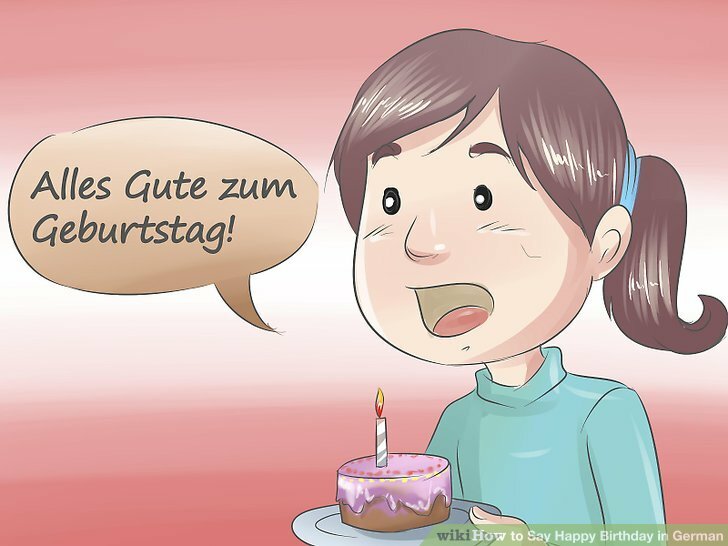 Exclaim “Alles Gute zum Geburtstag! 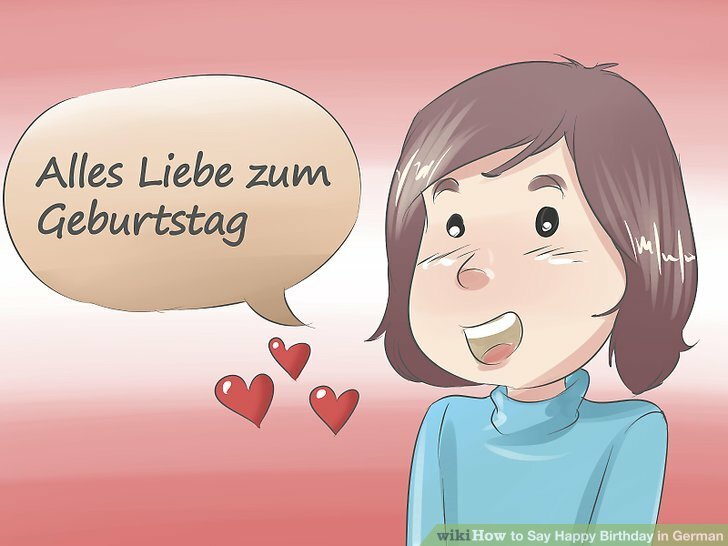 Geburtstag means “birthday” in German. Pronounce the entire birthday greeting as ah-less goo-teh tsuhm geh-buhrtz-tahg. 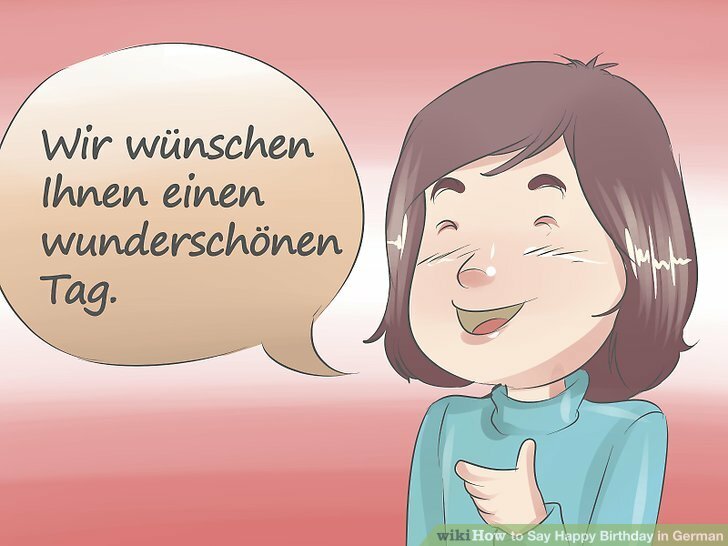 Offer “Herzlichen Glückwunsch zum Geburtstag. ” This is an equally common, congratulatory birthday greeting. Pronounce the statement as hairtz-lich(“ch” as in “aCH” NOT as in “CHair”)-enn glook-vuhnsh tsoom geh-buhrtz-tahg. 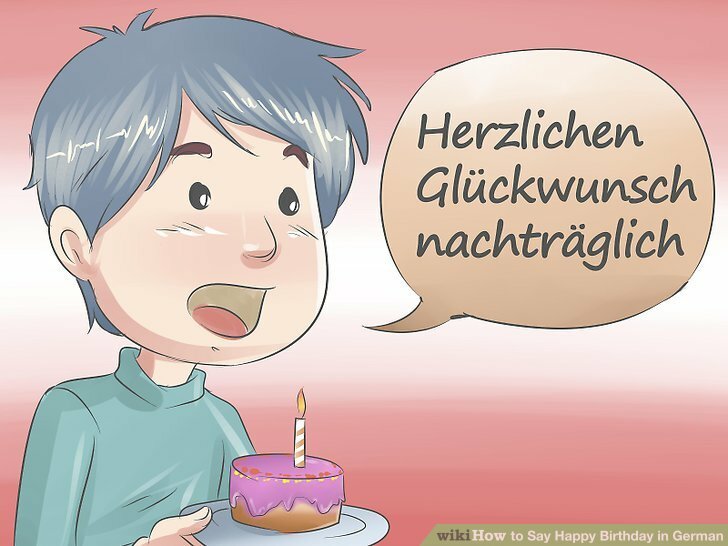 Say “Herzlichen Glückwunsch nachträglich” or “Nachträglich alles Gute zum Geburtstag” for late wishes. Both are equivalent to saying “happy belated birthday” in English. Herzlichen Glückwunsch nachträglich means “heartfelt congratulations belated.” Pronounce it as hairtz-lich(“ch” as in “ach” NOT as in “CHair”)-enn glook-vuhnsh nach(“ch” as in “aCH” NOT as in “CHair”)-traygh-lich(“ch” as in “aCH” NOT as in “CHair”). 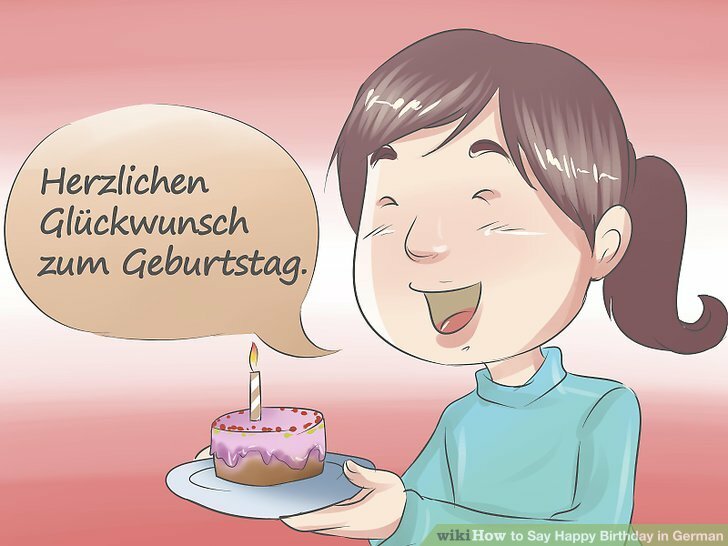 “Nachträglich alles Gute zum Geburtstag” means “belated all the best for your birthday.” Pronounce it as nach(again as in “aCH”)-traygh-lich(again as in “aCH”) ah-less goo-teh tsoom geh-buhrtz-tahg. State “Alles das Beste zum Geburtstag! Pronounce this sentiment as ah-less dahss behsteh tsoom geh-buhrtz-tahg. Say “Wir wünschen Ihnen einen wunderschönen Tag. ” Use this statement to wish the birthday boy or birthday girl a wonderful day. Wir means “we” in English. Ihnen is a polite way of saying “you.” To make this statement informal or casual, replace Ihnen with Dir, the informal version of “you.” Pronounce Dir as deahr. You should pronounce this sentence as veer vuhnshen ee-nen aye-nen vuhn-deher-shuhn-nen tahg. Hopefully state “Auf dass Ihr Tag mit Liebe und Freude erfüllt ist. Dass is a German conjunction meaning “that” in English. Ihr is a polite way of saying “your.” For a more informal way of saying “your,” use Dein, pronounced as dine. Pronounce the whole thing as owf dahss eer tahg mitt lee-beh oond froy-deh ehr-foolt ist. 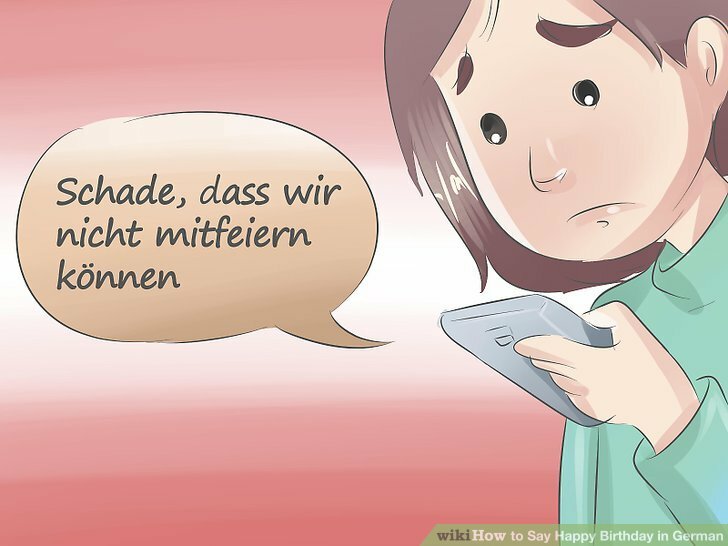 Tell someone “Schade, dass wir nicht mitfeiern können” when you cannot celebrate in person. This phrase means “Shame we cannot be there to celebrate with you.” Use it over the phone, in a greeting card, or in an e-mail when you cannot give the individual birthday wishes in person. Pronounce the sentiment as shah-deh dahss veer neecht(“ch” as in “aCH” NOT as in “CHair” mitt-fy-ehrn keu-nenn. 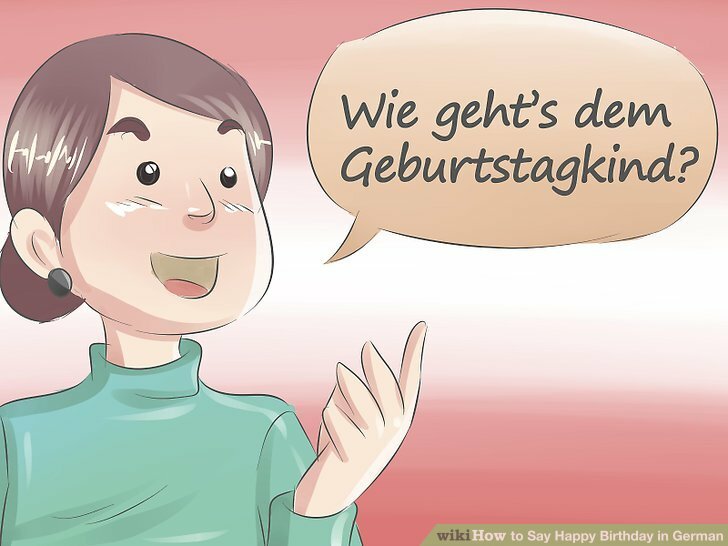 Ask “Wie geht’s dem Geburtstagkind? 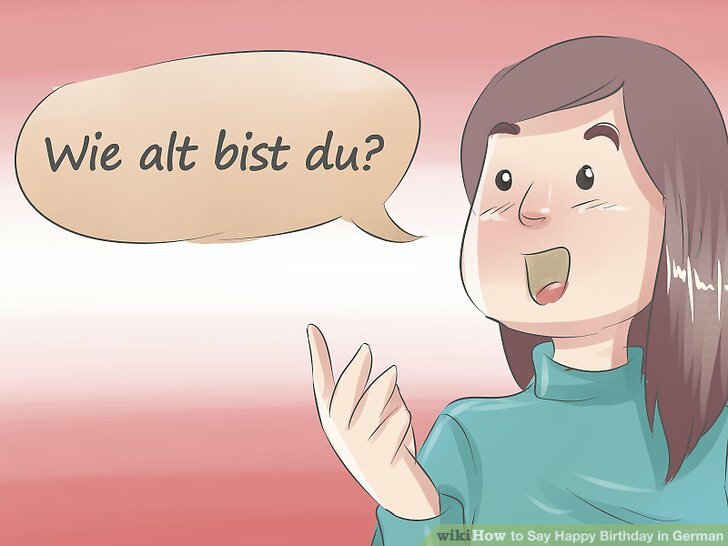 Wie geht’s is a German interjection that means “how are you doing?” in English. The expression as a whole should be pronounced as vee gates dehm geh-buhrtz-tahg-kint. Also ask “Wie alt bist du? ” This question is used to ask someone’s age. 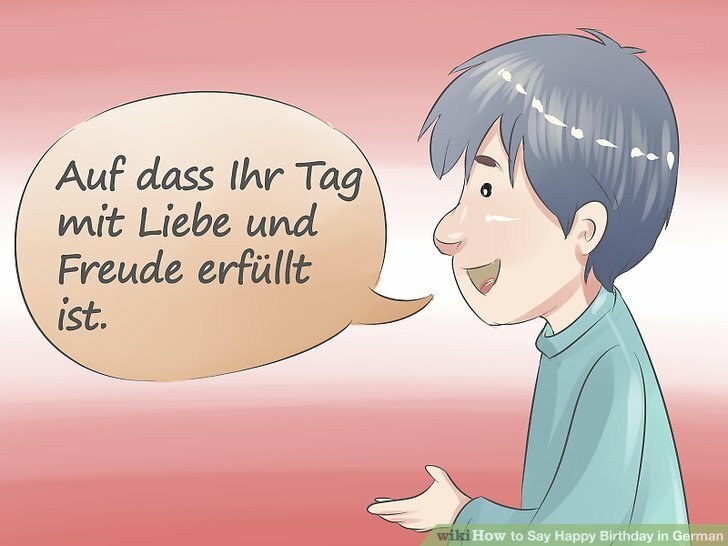 Offer “Alles Liebe zum Geburtstag. This sentiment should be pronounced as ah-less lee-beh tsoom geh-buhrtz-tahg.